Ubuntu 9.04, codenamed Jaunty Jackalope, was released on April 23rd, also celebrating the 10th Ubuntu release. Since its first version back in October 2004, Ubuntu went through many improvements and quickly became one of the most popular distributions out there, with a huge and continuously thriving community and a fast development method. Free CDs through the ShipIt service can be also ordered, which is another way from which users can benefit of Ubuntu and spread it. Ubuntu is based on Debian, one of the oldest distributions out there, well-known for its highly stable releases, but it delivers the latest versions of applications with each release and offers a more polished desktop. 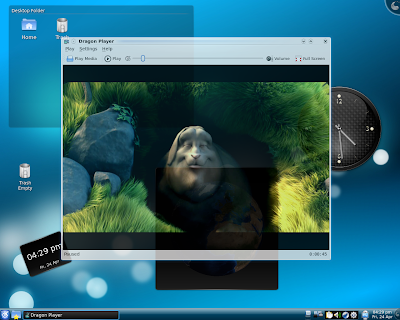 Many other projects were born based on Ubuntu, including Kubuntu (which is practically Ubuntu using KDE instead of GNOME), Edubuntu (for educational purposes), or Xubuntu (using the Xfce desktop environment). 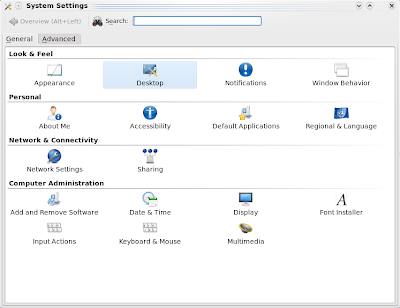 In this article I'll overview Kubuntu 9.04, which comes with KDE 4.2.2, bleeding-edge software like OpenOffice.org 3.0.1 and Amarok 2.0.2. First of all, Kubuntu was always known as Ubuntu's little brother, since it was based on KDE and opinions were always different regarding its stability. Some say Kubuntu was always a buggy distribution, and probably the worst KDE-based distribution out there, while for others it works very well. Since Kubuntu shares the same repositories with Ubuntu and the KDE packages come from Debian Sid (the unstable Debian repositories), this can be understandable, especially that usually the Ubuntu community focuses on GNOME. I took the following screenshots at 1280x1024, with the nVIDIA 180.29 driver on a GeForce FX 7600GS graphics card. As usual, I noticed incompatibilities between KDE's desktop settings and nVIDIA driver, but they seem to go away after using nvidia-settings utility to set resolution and save settings to the /etc/X11/xorg.conf. I made a full review of Amarok 2.0.2 on Kubuntu here, and although I found it buggy and lacking features, 2.1 promises great improvements. There was a problem after ticking the 'Ctrl+Alt+Backspace restarts the xserver' check box in System Settings' Display tab (it didn't restart the X Server), but it went away after setting the resolution through the nvidia-settings tool. I could notice Dolphin will eat 100% CPU and practically freezes the system when moving the mouse over a Quick Time .MOV file (I guess that's because codecs are not installed, but nevertheless, this should be fixed). I liked to see KDE 4.2 is much faster than how it was in Kubuntu 8.10. Great transparency effects, wobbly windows, animated minimise/maximise of windows are just a few of the wonderful desktop effects KDE has to offer. Overall, Kubuntu 9.04 seemed, at least to me, buggy as usual. The pppoeconf utility does not seem to work, despite the fact that the Internet connection works flawless in Debian; (update: this proved to be actually a problem with the ISP),there are still some problems with fonts when changing resolution (this is probably a KDE issue, since it's been there for years, KDE3 too). 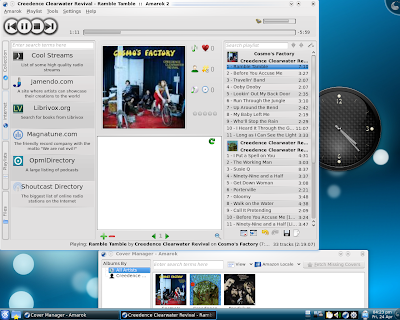 But still, with a little tweaking, Jaunty can offer a good KDE 4.2 experience and bleeding-edge applications. For couple good reasons, I don't believe your bloat comment. I have been running Kubuntu 8.10 with KDE 4.2.x for a while now on two different computers. I just recently upgraded to Kubuntu 9.04 on my 5 year old HP D330 ST which comes with 2.4 GHz and 741 MiB memory, & 512 L2 Cache, and ATA ST340015A drive. Not only it is faster than Kubuntu 8.04, it is so snapy I myself can't believe it since I run a development web site on it with Apache 2.x & MySQL 5.x. I don't know what type of computer you are running, but the only thing I see bloated is the common perception itself about KDE 4.x being bloated. When others evaluate Kubuntu, I hope they try to be more objects in their process and present valid test results to prove their points. - My graphics card is Intel 82864G Integrated Graphics Controller which I have no problem with at all. - It is CPU intensive at times, What is using all that CPU you on your system? I will try it when you respond. Other than that, I find it to be acceptable for what I am running on it. I will post more as I find new things. 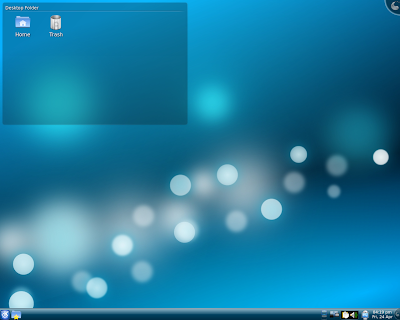 I;ve had my fill of Kubuntu for the week. I upgraded the two Kubuntu 8.10 that were working well to 9.04 and both are now freezing big time. I then tried installing it on another computer and I can barely get to the menu before it freezes non-stop. Just to prove to myself that it wasnt the CD, I downloaded it again and burned it one more time... Same problem. FInally, since I had two borked systems, I installed PCLInuxOS2009 w KDE3.5 and Mandriva 2009 w KDE4.2 no problem so I tried then both on the third system and it works well now. That said, there is a lot of things I dont like about Kubuntu, how it breaks things. it doesnt mean Kubuntu is bad, just that I've had bad luck with it. I was using 6.10 and 7.04 and they were the ones that convinced me to go to PCLinuxOS2007 as my go-to distro for family members and out of about 20 installs I did, only one gave me a small problem. Is it better? Not sure but I use it because it gives me no grief. 19 out of 20 is a pretty good average (and the one problem was because of this obscure hardware). My brother in law tried 8.04 because he coudlnt stand the Ubuntu that came with his Dell Mini (said it looks an old Win95) and Kubuntu 8.04 didnt work for him while 8.10 works beautifully. I asked him if he was going to upgrade and he said no. He's afraid it wont go well. Bottom line, Kubuntu or another KDE is not a big difference but smooth and user friendly is not Kubuntu's big selling point. As a Gentoo user, I could care less about the fanboi debates about the minute differencees between distros. But Kubuntu still has problem with stability and its gonna be a long time before I trust it as much as I trust PCLinuxOS or Mandriva 2009. What? a buggy (k)Ubuntu release? who would have ever seen that coming? I'm a very loud naysayer of Kubuntu. I love KDE but I've never had a great KDE experience with Kubuntu. There always seems to be something hopelessly broken. Gwenrename is a prime example. A bug filed nearly three years ago and instead of fixing it they bicker over why it is a bug. A simple renaming of an icon would fix it straight away. Kubuntu will always be buggy. It is pretty heavy compared to other distros too. I can't prove it but it feels that way. The wireless applet is a bit odd but once you have managed to wrangle it set up, it is good. The ATI drivers are a real step back but once I moved to UXA it is so very very fast although freezes with the 3D stuff on, I turned it off and all was well. Laptop lid doesn't work and hasn't since 8.04. I still can't get Strigi to work and never have. The laptop fan is always on compared to how it used to be which is a little annoyance. Samba shares work some times. That said it is a real improvement as it is so freaking fast compared to what I had and on the whole working very well. 8.04 was the last release for me without any problems at all (hardware related) but a step in the right direction. why did I have to do this...? Please read feedbacks and you will see that I am not only one that is not satisfied..
it freezes every time and i have to force power off.. I am so sorry for this, I love my kubuntu and it would be great to write about blazing boot times, but that all seems irrelevant in the sea of troubles that I am dealing with. I am writing bug reports today, and hope it will help in solving at least some of the troubles. Initially I did an upgrade. I encountered problems too. - During the upgrade, it froze and I had to kill the power to restart. System booted OK but KDE wouldn't start automatically, It did come up when I launched startx from console. Networking didn't get configured and I wasn't able to configure it manually. Ran adept again and it did recognize the original failure. It did complete upgrade/update of few more apps but encountered another issue. I couldn't get around it and finally gave up and did re-install. So far I haven't had any issues with what I have tried. I have been very happy with 8.10 with KDE 4.2.2 on my laptop and now I am hesitant to upgrade to 9.04 because of all the problem you guys are citing. I will wait a while before I upgrade the laptop. Those who did upgrade and having problems might want to try re-install and see if it makes a difference to them like it did for me. I have to agree that Kubuntu is a little buggy... from running LiveCD to running from the harddrive. - no response after wireless configuration (entering passphrase). it seemed that the passphrase was not stored even after setting the password for Kwallet when asked. Once I after I managed to get wireless connection to work after a dozen attempt, I installed wicd. Reboot and the wicd worked like a charm after I enter the required passphrase for WPA. My guess is that Kubuntu will be OK in a few weeks they fix what being reported. I just have one issue with KDE 4.2.2. It doesn't work on my Lenovo z60t laptop at all no matter which KDE 4.2 based distro I use. Other than that KDE 4.2 is great. Since it won't work at all I guess I have nothing to complain about :). Fresh install on new hardware. Works well, but KDE4 is going to take some remedial GUI training on my part. why can't you kde4 people understand that i don't want kde4, widgets, plasma, dolphin, folder view, etc. i don't want to "change my desktop paradigm". i like it just the way it is. why are you all taking kde3 away from me. it works fine. i don't care how "snappy" kde4 is. i can't use it. it don't matter if it works or not, i just simply don't like it. if y'all like it then fine but don't force it on me. and i'm getting sick and tired of being made to feel ashamed because i don't like it. i ain't gonna use it and y'all need to stop trying to tell me how marvellous it is. i don't care. i want kde3. thank you. "why can't you kde4 people understand that i don't want kde4, widgets, plasma, dolphin, folder view, etc. " No one is forcing you to use KDE4 because there are distros that still use KDE 3.x. PCLinusOS is one, which is a very excellent (may the best in my opinion). How long this will be available and supported is the question to ask. I presume it won't be for long once KDE 4.x has all things ironed out. 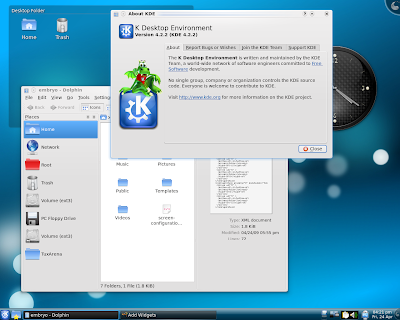 KDE 4 is a framework for the future desktop. One just can't stay stagnant while the competition is fierce. GNOME desktop now find it very difficult not to jump and start laying out a new framework. They already announced they will start on GNOME 3.x. I just tried kubuntu 9.04 live CD. Not surprised that I could not get the display set up properly. It just seems like they are trying to kill kubuntu, it is so bad. I don't understand throwing out things that work and replacing them with things that don't. That is keeping up with the competiton? I really liked kubuntu when it worked, back around 7.10. I firmly and strongly disagree with all the bad news about Kubuntu 9.04. I had 8.04 working perfect. My upgrade to 8.10 was unsatisfactory with mouse hang over, desktop effects problems. Now upgrade to Kubuntu 9.04 is superb. No more mouse hang problem. But I have not enabled desktop effects due to fear of 8.10 frequent crashes. I hope that there will be glad news soon from the Kubuntu Developers regarding Desktop effects enabling. Also the problem of configuring a printer has cropped up in 9.04 upgrade which may be fixed. And so far I like it. I haven't had to many problems. One problem that I did have was the minimize and close buttons just vanished completely. But metacity fixed it easily. Also upon instillation the sound wasn't working, it really wasn't a major problem to fix. Other then that its been going smoothe for me. Hi guys, long time Linux fan here.. I hate to say it but kubuntu is buggy and unstable as hell. It is sad and makes me want to run back to the arms of Mr. Gates. I despise what Windows has become and I am not happy running it, but at least it works....almost all the time, how frustrating is it when you can't get a simple task to run properly? I really like Linux and trust it far more than Gates's closed off sneaky outright lies about his OS. If I can't get something to work without reading a plethora of info. and, after reading still cannot get it to work, then screw it, life is too short for that type of frustration. - Intel Graphics: Let's not beat around the bush here. K/X/Ubuntu all suffer from the Intel GFX problem, due to a mismatched kernal/stack/driver/driver-setting. 9.04 will suffer until it's last days, and it's not fair to blame Kubuntu for being sluggish when it affects all variants. - Broken flash: Using Konqueror? I got it working by going into preferences, tunneling into the plugin options and scanning for plugins after installing it. Not great but not the hardest labour. - Wireless: works a lot better in 9.10 that's for sure - this is KDE specific sadly, and I've had to pull the battery on my Acer Aspire One many times to get it working. - cpu usage: My AAO runs like a dream now! If you have a spare machine or VM, try pie try... It's a lot better than 9.04 - obvious alpha warning apply. I am a Windows 'expert', who has been studying Linux seriously for about a year now. I'm *trying* to switch myself, and others, to Linux. I've looked hard at about 40 distros. I keep waiting for Kubuntu to get it's act together. It just ain't happening. *Or* I'll use Ubuntu, (deleting the mono libraries,) and either install KDE myself, or, just use Gnome. Kubuntu = Bugs, bugs, bugs, bugs, bugs, bugs, bugs = Not worthy of serious consideration, or wide-spread distribution. Which breaks my heart. I'd hoped 9.04 would be better, but as you can see by all of the bugs detailed in previous comments, it's nowhere near ready. Maybe next year. Or in a few years. Or in 10 or 20 years. Kubuntu is unacceptably buggy. I wish it wasn't. "A fool can drop a pearl into a river which ten wise men will not be able to retrieve." "The incompetent practitioner blames his tools; and often blames others, as well." 64-bit is the way to go, which eliminates OEM dinosaurs (including XP and Vista retail OEM pre-installs). Intel graphics is definitely a problem which is not easily solved for Jaunty. I do get logoff hangups, too. Makes me push the power button. Wireless networking works without a problem, but static IP addressing must be set manuallt in a configuration file. Flash works without a problem. Kwallet is a matter of taste -- I turn it off as the earlier user did. High CPU usage? You using Tor, Ktorrent, or some other background process? My Kubuntu is lickety-split. Pulse Audio is 85% there. It still stumbles over itself in places and is not (yet) the most user-friendly. 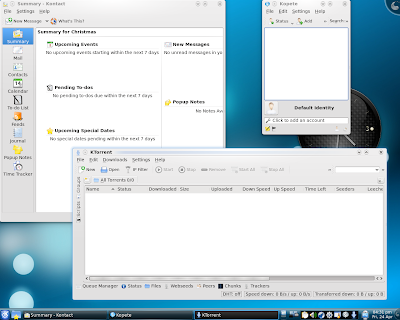 The advantage of Kubuntu over Gentoo/Mandriva/PCLinuxOS is the fact that it shares repositories with the Gnome-based Ubuntu. Something not working in KDE/Qt ? Big deal. Install the GTK-Gnome version and keep on working. I'd say my "Kubuntu" box currently is 20% Gnome-based programs. That's the power of the Ubuntu/Kubuntu meld. You can mix and match. Can't do that as easily with other distros (including Windows, btw. My XP programs don't work in Vista/Win7). Bugs? I have fewer bugs in Kubuntu 9.04 than I do in Windows Vista. On the other hand, I have a Logitech Notebook Deluxe webcam that only has Windows drivers and doesn't work in Windows (I have to choose my add-on hardware carefully in Linux). If I need hardware that only runs in Windows, I run Linux from Wubi. Otherwise I run Kubuntu 97% of the time without problems. Of course, I use Kubuntugide.org frequently.